Donkey Kong has stolen Mario's girlfriend Pauline, and now Mario must rescue her from the monstrous primate, but it won't be that simple! With Donkey Kong and his antics, it will make it all the more challenging! 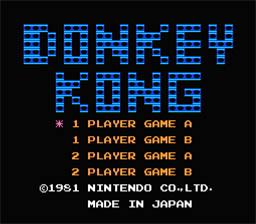 Donkey Kong on the NES was a great port from arcade to home console. This was always one of my favorite games. Donkey Kong is one of the great classics of our time. It kicked off some very profitable careers for a few characters, including Mario. Mario in this game was actually called Jumpman at the time, and the Princess was still Pauline. They later dubbed her Peach. Donkey Kong also went on to have his own following. The Donkey Kong Country series did extremely well. Donkey Kong is definitely worth your time so give it a go! You must avoid all obstacles, via jumping or using hammers, and climbing ladders, to get to Donkey Kong and Pauline. But when you take a jump, make sure it's a short one, because you may fall and die, losing a life. The levels will keep getting trickier as well. Remember that if you have a hammer in your hand, you can't climb a ladder.